Notes: Generator is a highly versatile multi-channel analogue step sequencer. It provides a fun and intuitive, yet powerful way to create rhythms and melodies with your modular and CV synths. Why do I need this sequencer? What's so special? Generator is a very compact and high-quality step sequencer. It's USP is that it is a playable sequencer. You don't just set up a sequence and leave it looping. The UI is designed in such a way as to make it easy, fun and intuitive to alter the rhythm and to get alternative sequences playing using the real time touch pads. 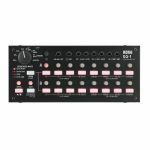 Analogue Solutions have given this sequencer a large and diverse number of controls, that along side the patch sockets, will give even the best and experienced electronic musician endless possibilities. The controls are presented in a user friendly and familiar sequencer layout that, together with this manual and other resources, enable even the new guy to get great patterns quickly. Gate output, with an inverted 'flipped' output (positive voltage, but the 'state' is inverted. So this output does the opposite of the main Gate output). Six 'note' interval voltage generator keyboard. Use to transpose the sequence, reset, start and other things too! Can be clocked by the End Pulse creating a mini-sequence that changes once per bar. Can be used independently as a mini keyboard! Notes: Arturia's BeatStep offers a new degree of functionality and performance for a portable pad controller. BeatStep is highly versatile, capable of triggering clips in such applications as Ableton Live, it also allows you to play drums in conjunction with such applications as BFD or EZDrummer. BeatStep is also a 16-step analog sequencer for creating all kinds of musical phrases to be sent to analog synthesizers, MIDI drum machines, MIDI keyboard devices, or computer programs. Its vast connectivity allows you to interface BeatStep with a computer or iPAD using USB, a drum module using MIDI or an analog synthesizer equipped with CV/GATE. BeatStep is designed to give you the control you need whether it is in conjunction with your favorite DAW or loop triggering software, VST Instrument or Effect, Drum software, DJ application, MIDI synth or even CV/GATE equipped analog gear. The possibilities are nearly endless. BeatStep fulfills multiple requirements for a wide variety of musicians. It is a true chameleon in that it can become many things to many people. No other compact pad controller on the market offers this level of control along with a step sequencer at such an amazing price. Beatstep's 16 pads are both pressure and velocity sensitive which means that they allow you to capture the nuances of your performance. Beastep is the perfect control surface for producers and percussionists using iPads or software instruments such as BFD, Kontakt, Live's Drum Rack, EZ Drummer, Addictive Drums, Geist or Reason Kong. BeatStep goes beyond the typical pad controller functions by adding a step sequencer. This opens it up for people who are using either MIDI modules, CV/GATE synths like the MiniBrute or MicroBrute and also to people using plug-ins on their computer via USB. While your sequence is playing switch to Controller mode and use the pads and knobs to enable and disable effects or tweek filters, attack and decay times on plug-ins, etc. BeatStep will allow you to create new ideas and add to your live performances in unlimited ways. Wether you use Ableton Live, Traktor, Serato or any other DJ/clip playback software, the Beatstep pads are perfect for launching samples or enabling effects. The 16 encoders give you lots of possibilities of mapping them to eq's, filters, delays and other performance effects. BeatStep makes a stylish and portable companion to your other DJ control surfaces. Beatstep is the perfect solution for stage performers looking for a solution to send Midi messages and control changes to their hardware gear and workstations. Thanks to the included Midi Control Center, mapping Beatstep to your needs becomes a breeze. With 16 velocity and pressure sensitive pads, BeatStep is the perfect compact solution for playing percussion. The ultra sensitive pads allow for great dynamic performances. The 16 encoders can be assigned to adjust parameters that allow further real-time control over your drum sounds. Add to this the 16 user presets and you can have controller setups for all occasions. The Step sequence mode turns BeatStep into a completely different product. A step sequencer is the most basic type of music sequencer. They were popular in the 1960's and 70's. They have come back into fashion with the popularity of modular synthesizers. There are examples of step sequencers in our Arp2600 V, Modular V, and Jupiter 8 V software. In SEQ mode, the pads and encoders work together to set and enable steps in a sequence and set pitches for each step. By simply pressing a pad, it will enable or disable the current step in a melodic pattern. With a few presses, you are creating and changing up musical patterns in real-time. BeatStep allows for 16 sequences to be stored in memory and recalled instantly. This allows you to play multiple patterns and create your own songs. Setting pitches on a step sequencer can be difficult, to allow you to find the notes you want we added scale modes that quantize the pitches of the encoders to a specific set of notes. This means that instead of having the encoders move up and down chromatically like most step sequencers, you can set BeatStep so that you will only be allowed to pick notes that belong to the scale you want to work in. Look ma, no wrong notes! It is optimized for live use, especially jam-sessions, but can also be used to give you new ideas, if you are stuck in your main sequencer. - All settings can be changed while it's running. - 2 x 8-step-pattern, that can be used alternatively or chained to a 16-step-pattern. - Normally the pattern changes, when the one that is played ends. With a special "jump"-button it is possible to jump from one pattern to the other immediately without loosing synchronization. - It is possible to edit the pattern that is playing or edit the other pattern. - LEDs next to the potentiometers display after changing the pattern, if the position of the potentiometer is corresponding to the used value. If not, the position of the potentiometer is not used and the LED stays dark until the potentiometer passed the used value. - One pattern can be copied to the other. - Several steps can be put together, to get different note-lenths in one sequence. - The first step can be adjusted (independently for each pattern, to make it possible to get sequences with odd numbers of steps, that are bigger than 7 steps (e.g. 13 steps). - The last step can be adjusted (independently for each pattern, to make it possible to get sequences with odd numbers of steps, that are bigger than 7 steps (e.g. 13 steps). - The clock-divider can be set in 8 steps (1/1 to 1/32). - The velocity can be set in 7 steps (1 to 127). - The 8th position for velocity is a mode, where a random number is created for each step and used as velocity. - The range that can be programmed with the potentiometers (from full anticlockwise to full clockwise), can be set in 7 steps (13 notes to 128 notes). - The 8th position for range is a mode, where the same note is played for every step and the potentiometers are used to program pitchbend. This makes it possible to program patterns, that are not pitch-quantized in halftone-steps. Because pitchbend is interpreted different from synthesizer to synthesizer, the maximum range that can be programmed, depends on the used synthesizer. - The lowest note can be set in 8 steps to transpose (C0 bis C7). - The gate-length can be set in 16 steps. The highest value makes the last note end after the new note starts to get a legato-effect. - It is possible to generate two additional notes by setting their interval to the note set by the potentiometers. You get up to 3-voice polyphonic patterns similar to things done with "chord memory". - The sequencer can be pushed forward or backward a step or midi-clock-tick (same as audiowerkstatt midi-clock-shifter ). - If you got lost (e.g. after changing clock-divider, first- or last-step), you can restart the sequencer without stopping the master (same as audiowerkstatt midi-restarter ). - All settings can be changed while the sequencer is running and all settings are stored after powering down. Notes: Dark Time is an 2x8 step analog sequencer with CV/Gate, USB and MIDI interface. It is intended as an add-on for the Dark Energy but may be used in combination with other MIDI, USB or CV/Gate equipment too. Notes: When the classic MS-20 analog synthesizer appeared in 1978, it had a trusted partner in the SQ-10 step sequencer. Now, after thirty years, the MS-20 has been reborn as the MS-20 mini, and the SQ-10 has evolved into the more modern SQ-1. 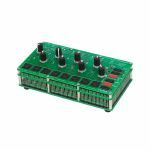 The SQ-1 is a compact step sequencer with 2 x 8 steps. It's wealth of connection jacks allows it to be connected to the MS-20 and a variety of other synthesizers. Vintage analog synths or the latest compact synths can be controlled from this single unit. You can also switch between a variety of synthesizer modes and use the step buttons to create performances overflowing with spontaneity, just as when using a volca unit. Liberate yourself from the numerically-bound parameter editing that's typical on a DAW; you'll enjoy truly musical inspiration as you train your ears and concentrate on what your fingertips are doing. Don't miss the experience of music that's driven by your instinct. 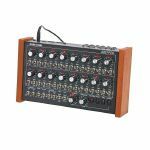 Rather than the commonly used V/Oct standard, the CV design of the MS-20 always used the Hz/V standard that provides excellent pitch stability limiting the step sequencers that are able to correctly control the MS-20. As a descendant of the SQ-10, the SQ-1 supports the Hz/V standard, enabling it to perfectly control the MS-20 or MS-20 mini. It goes without saying the V/Oct standard is also supported, and the voltage level of the CV output and polarity of the GATE output can be specified as appropriate for the device you've connected. This versatility will enable you to control a wide variety of other synthesizers as well. As a connector, the SQ-1 provides two CV/GATE OUT channels, the standard MIDI OUT and USB MIDI, littleBits out (to connect to the littleBits synth kit by littleBits Electronics Inc.), plus the SYNC IN/OUT channel that allows you to connect to the volca series and monotribe. Compact and complete with all the functions you need, the SQ-1 is the ideal hardware sequencer. The SQ-1 provides two channels (A and B) of 8-step sequencer that can operate consecutively, or be used in a variety of other modes. For example, you can run A and B following each other to function as a 16-step sequencer, ignore the order and make the steps play randomly, or use A and B to control different parameters as they run in parallel. From simple sequences to complex changes, you can choose from a variety of modes to suit your needs. The 2 x 8 step buttons can be used in the usual way to turn notes on/off, but you can also use the MODE button to switch their function, opening up powerful possibilities such as letting you "perform" the sequence itself, as on a volca unit. "Active Step" lets you skip steps mid-way through a sequence, and "Step Jump" lets you instantly play just the step that you press, producing irregular rhythms or effects that are reminiscent of short loops. "Slide" produces an effect in which steps are connected smoothly; using this to control a synth bass is an easy way for anyone to generate an acid sound. Packed with carefully selected functionality, the SQ-1 features a compact and very sturdy sheet-metal body. Placed beside the MS-20 series, you'll notice a sense of solidity that gives the impression they were manufactured in the same era. The unit can operate on two AA batteries or on USB bus power. Sequence step resolution is selectable as quarter notes, eighth notes, or 16th notes. You can specify the way in which the step knobs control the pitch. The knob values can specify the pitch directly, or they can specify the closest note in a major, minor, or chromatic scale. When the classic MS-20 analog synthesizer appeared in 1978, it had a trusted partner in the SQ-10 step sequencer. Now, after thirty years, the MS-20 has been reborn as the MS-20 mini, and the SQ-10 has evolved into the more modern SQ-1. Notes: The new Korg Volca Sample is a very intuitive and powerful volca sequencer, that allows you to sculpt samples with the Analog Isolator, and also features loads of new functions such as dedicated iOS app; song mode and reverse function. This sequencer lets you recapture the excitement of the first generation of samplers, in which any sound --- vocals, spoken words, ambient sound, or glitches --- becomes material for your creations! The step sequencer is designed for ease of editing and to allow parts to be inserted or removed "on the fly." Use the 16 step keys to enter notes intuitively while maintaining visual confirmation of the timing of the notes in a measure. You can also record your performance in real time. Up to ten of the sequence patterns you create can be stored in internal memory. The motion sequence function records your knob movements, letting you add time-varying change to the sound. This is a great way to polish your loops, and also lets you generate highly original live performances. The volca sample is able to record all knob movements that are related to sound editing. This allows sophisticated editing that had been impossible for hardware samplers of this category. The Active Step function lets you skip steps during the sequence, and the Step Jump function lets you instantly play just the step that you're pressing. From short-loop effects to unimaginably irregular rhythms, these functions allow dynamic performances as though you were performing the sequence itself. The Swing function adjusts the swing playback position, generating the distinctive groove of dance music styles such as hip-hop. As appropriate for the character of your song, you can shift between rushing and dragging the beat. Volca sample features a frequency isolator, which has become a powerful tool in the creation of numerous electronic genres. This lets you apply powerful changes to the sound and create development and breaks by boosting or cutting the low/high ranges. The isolator is implemented as an analog circuit, ensuring thick sound even in the flat position. The built-in reverb effect can be switched on/off for each part. The isolator and reverb can be used together, enhancing your live performance with possibilities such as cutting the low range and letting it fly. Notes: The SEQ12 is a MIDI Matrix Sequencer (in a console housing) and offers one MIDI Input and three MIDI Outputs. It gives access to 12 tracks and you are able to choose between three track types: drum, chord and monophone. Each track has 2 or 3 controller tracks, routing on MIDI outputs and MIDI channel adjustable. Also, each track has 16 patterns, these can be played in freely programmable sequences one behind the other. Each pattern has its own shuffle pattern, 2 to 3 controller tracks and additional ratchet modes with programmable pitch and trigger patterns. The product can record MIDI notes and controller values via MIDI In and the data can be edited using the LED buttons. There are 32 memory slots in the device and it has a very stable and accurate timing. The MIDI data are displayed in dedicated views on the LED button matrix. Each sequence has a freely adjustable shuffle pattern and clock divider. This also triplets, etc. are possible for each sequence, the nonlinear mode can be activated with different multiple trigger patterns and clock dividers per step. Shortest possible grade: 1/32. Automatic smoothing of controller values can be activated. Free choice of midi channel and exit per track. Each track can play their sequences in a given order (Chain). There are 8 parts (stanza, chorus, bridge etc) with 12 tracks each for the tracks. Notes: Unlock limitless creativity with the SQUID multitrack sequencer. Part of our TORAIZ series of musical instruments and production equipment, this inspiration tool will be the heartbeat of your studio and live setups. The SQUID will control your workflow and give you the chance to develop new styles of music as you create unique sequence patterns and phrases at the touch of a button. Connect, sync and simultaneously control up to 16 instruments via its multiple input/outputs. The terminals are compatible with various equipment, from your DAW and hardware instruments to modular synths, vintage synthesizers and drum machines. Perfect for on-the-fly music production, the layout and controls are effortless to navigate so your ideas will come to life the moment inspiration strikes. This production tool enables you to randomize sounds, sequences, and drums - all in key. Access endless polyrhythmic-looping options and instantly change the playback direction and speeds. With the world-first Groove Bend feature, you'll really feel the groove as you generate original rhythms in real time. And by controlling everything in one place, you can focus on developing phrases. Have fun creating phrases by tapping the 16 multicoloured LED rubber pads in the Step Edit section. Set step parameters and play live as if the pads were keys on a keyboard. Combine various sequence functions such as Interpolation and Harmonizer to help build your sounds. Rearrange phrases you've created in the Step Edit section to craft your ideas the instant they spring to mind. Enhance your sounds with performance features, such as Running Direction, Speed Modulation, and Groove Bend. The SQUID records performance information in the background so you'll never lose phrases you create accidentally. When you're experimenting and hear something you love, use the Time Warp feature to recall and save it as a sequence pattern for your next track. The SQUID has a USB B terminal, MIDI terminals, 2 sets of CV/Gate outputs, and Clock and DIN Sync input/output terminals. This means you can combine the power of your DAW with modern, modular and vintage synths, as well as drum machines. Signals are converted automatically. Quickly transfer sequence patterns, projects and Midi clips between the SQUID and your PC or Mac with the SQUID Manager function. Easily import a sequence pattern created on your DAW to the SQUID, instinctively arrange it using the sequencer's features, and return it to your DAW. Notes: Polyend designed Seq with some non-digital musical devices in mind. They did it for a reason. Their goal was to implement features that make Seq as playable and fun to use as possible. They made it easy to set up and even easier to create rhythms, chords, and melodies. Most of the functions are available directly from the front panel and all its features give you the quickest and most natural way to bring your ideas to light. And, when you've got them together, rest assured they won't get lost thanks to the Autosave function. Seq is its own computing centre, hardware- and software- optimized to manage given tasks in the most effective way, without latency or glitches. Immediate responsiveness creates a synergy between the musician and the tool. It's an inspiration right from the very first step. Intuitive to use hardware step sequencer. 32 steps, 8 track polyphony, 256 pattern storage - all enclosed within the highest quality aluminium and wooden housing. Multiple connections give you the freedom to play with your hardware and software devices. It's designed for you to be inspired and, most importantly, fully enjoy the process of creation. Seq is all you need for the way you make music today. Equipped with a wide array of inputs and outputs, allowing you to communicate freely with other devices of every era and genre. Lets you feed tracks with MIDI notes using your favourite MIDI controller. Every track can be recorded step by step or in real time and then quantized independently. With two MIDI outputs, you can connect rhythm and sound machines simultaneously. You choose where to send out the signal from every track, and if that's not enough, you can also use the USB port for the same purpose. The use of oak and aluminium - materials of timeless quality - allowed Polyend to avoid the need for any flashy details, making what remains even more elegant in its simplicity. Seq buttons are made of silicone with specially matched density and firmness. Their shape, size, and arrangement were chosen carefully to provide an instant and explicit response. Most of the parameters and values can be read from the Seq interface at a glance. For the rest of them, Polyend provide a bright and sharp screen. Minimalistic, stripped down from any distractions, it brings all the information you need in any performing conditions you meet. Polyend designed Seq with some non-digital musical devices in mind. They did it for a reason. Their goal was to implement features that make Seq as playable and fun to use as possible. They made it easy to set up and even easier to create rhythms, chords, and melodies. Most of the functions are available directly from the front panel and all its features give you the quickest and most natural way to bring your ideas to light. And, when you've got them together, rest assured they won't get lost thanks to the Autosave function. Notes: Pyramid is designed to be the perfect brain for your musical setup, from studio to stage. 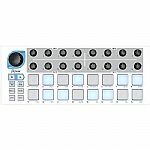 It brings together a powerful sequencer, a looper, a rhythm generator, a real-time effect processor, a midi controller and an input+output interface. Pyramid does not produce sounds. Instead, we have focused our energies on creating an innovative and complete sequencing solution full of creative tools. Pyramid is an instant source of inspiration to start, finish & perform your song! With Pyramid's high precision clock, the sequencer becomes a great synchronisation tool for both vintage and recent devices. Your instruments will always keep in time: Pyramid is the heartbeat of your studio. Even if you use a DAW as your primary sequencer, Pyramid will become an indispensable Swiss knife! Record a performance at any time with the built-in keyboard, the smartpads (generates chords, scales or repeats), the touchpad, the 5 encoders or an external controller... with true polyphony and high precision! Create and arrange complex rhythms and melodies with the full realtime step sequencer, or edit your live recording. Create CC or FX automation with the touchpad or with the 16 pads. Pyramid offers one algorithmic euclidean sequencer engine per track, auto generating uncommon and rich rhythmic patterns. Almost all traditional rhythms from across the world can be generated with this tool. Once your tracks are created, Pyramid offers several ways to play with your sequences: mute/unmute your 64 tracks on the fly, launch sequences (group of tracks), or chain sequences to create a complete, structured song. 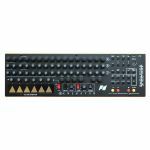 Pyramid includes 5 clickable encoders and a wide touchpad. The graphic display makes Pyramid fun and easy to use. Everything you need to know is spotlighted. And if you want to go further on, just press the "display" button. Pyramid is fully polyrhythmic. This means that you can set different and unusual time signatures on each track, to create shifted-beat sequences. Polyrhythmic constructions will bring new flavours to your productions.